I’ve been a full-time trash picker for four years now, though only in the last two has the endeavor been reasonably profitable. 2016 started off with a bang, but my luck turned sour starting around June and an encounter with the police made things even worse. I’m now reflecting on my future and considering what to do next. Still, I’ll always trash pick even if I change professions or focus on a new project, I just won’t do it quite as often. 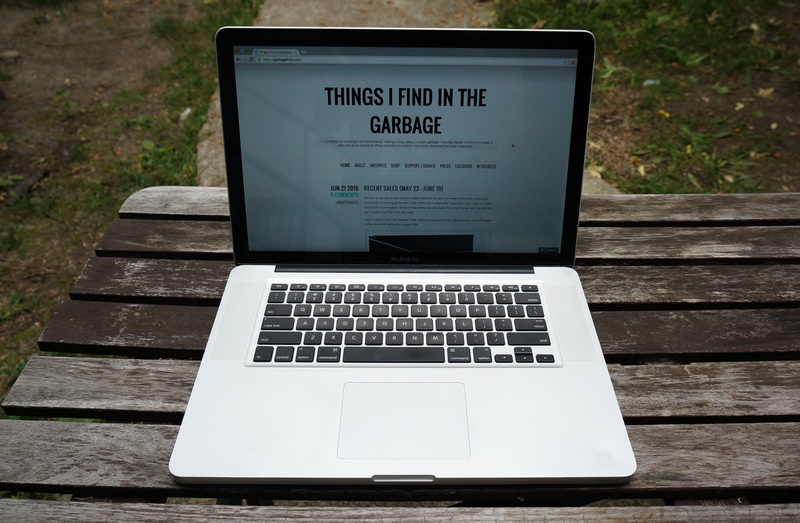 “Things I find in the garbage” will likely continue to be the most frequently updated trash picking blog out there in 2017. Otherwise, 2016 saw me continue to improve my selling skills. 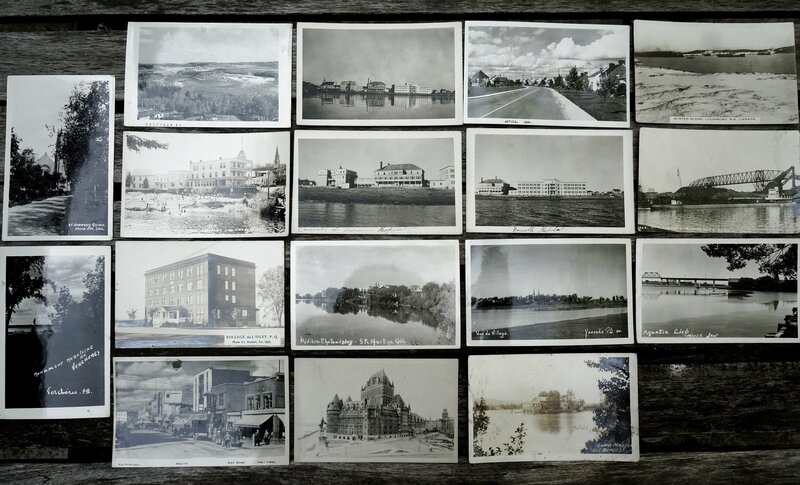 I professionalized my business by finding a decent laser printer, allowing me to finally start printing my eBay labels, by buying a light box which makes photography much easier, and by generally continuing to fine-tune the listing process. These tools and skills should come in handy going forward. Despite it feeling a bit like a down year in some ways, 2016s “best of” compares favourably to that of 2015 and is definitely superior to the best of 2014. So enough talk, let’s get to it! #3. Furniture for storing my crap. Early in the year someone clearing out a house allowed me into their home to check out some free furniture. He seemed like a nice guy who just wanted to be done with it all. I ended up taking this credenza, which turned out to be a mid-century piece made by Drexel. While it’s not in perfect condition the credenza is still very nice and quite useful, as the top middle drawer is great for holding various garbage-related tools. 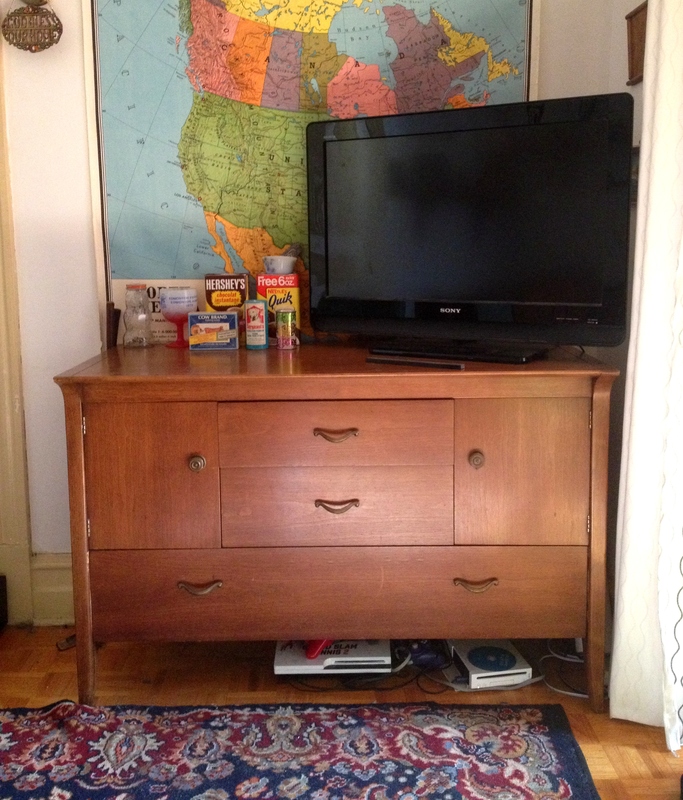 More recently I found a dresser and a filing cabinet, both of which also had a mid-century look. These pieces are now loaded with eBay junk. I’ve been wanting one of these for a while! I don’t have much space to work with so I like how it doesn’t clutter up my room with wires. These go for around 100$, making it a pretty nice get. I found it not long ago while biking around the Mile End. I have a long standing hatred of printers, but I took a chance on this one and it’s worked pretty well thus far. I rate it as the most useful find of the year in large part because I didn’t realize how much better shipping rates were through Paypal. I always figured it wouldn’t make much of a difference, but now I feel silly that I spent so many years writing out labels. It’s sometimes a dollar or more cheaper, and that’s just extra money in my pocket. 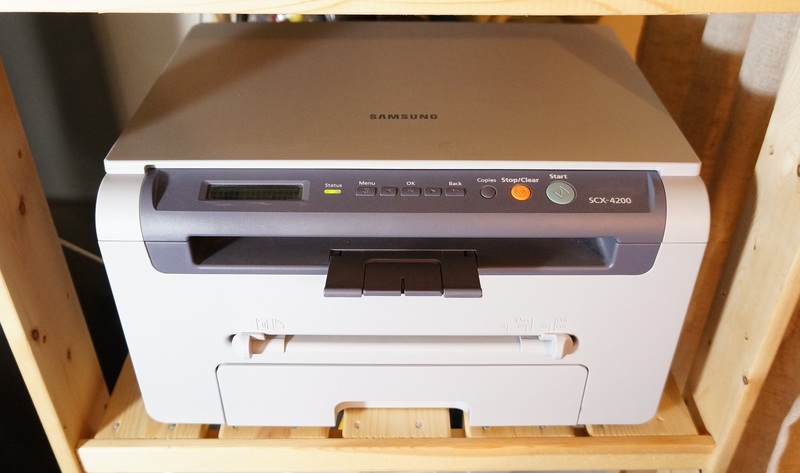 On top of that, laser printers are just a lot more cost effective as compared to inkjets. After years of trash picking I’m pretty much set for home decor stuff. 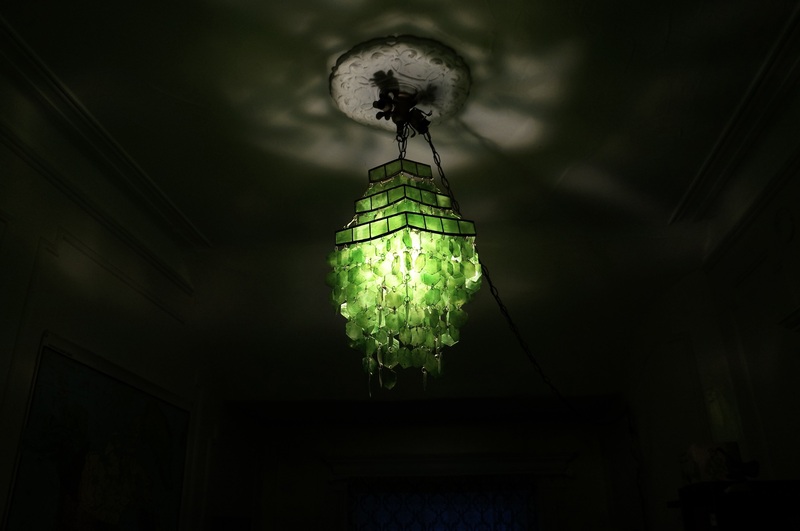 However, this chandelier made from circular bits of shell was a great find. It was in pieces when I found it, but I spent a few hours putting it back together and now it looks awesome. It really brings the room together. Who is he? I have no idea. I even asked Reddit but they didn’t know either. If you happen to know who this guy is, let me know in the comments! He’s currently a decoration in my room. Valium doesn’t exist anymore, at least by that name, so this was a neat find. The drug was at its peak popularity during the Carter administration, and definitely had an impact on the culture of the time. I enjoy finding things related to niche interests or fringe beliefs, and this year I made first contact with the UFO / conspiracy subculture. Many of the pieces were book lists from the 60s and 70s published by Gray Barker, the guy who pretty much invented the concept of the “Men in Black” but looks to have been a skeptic in his private life. I sold this lot for 55$, but in retrospect I think I might have been able to get a bit more for it. 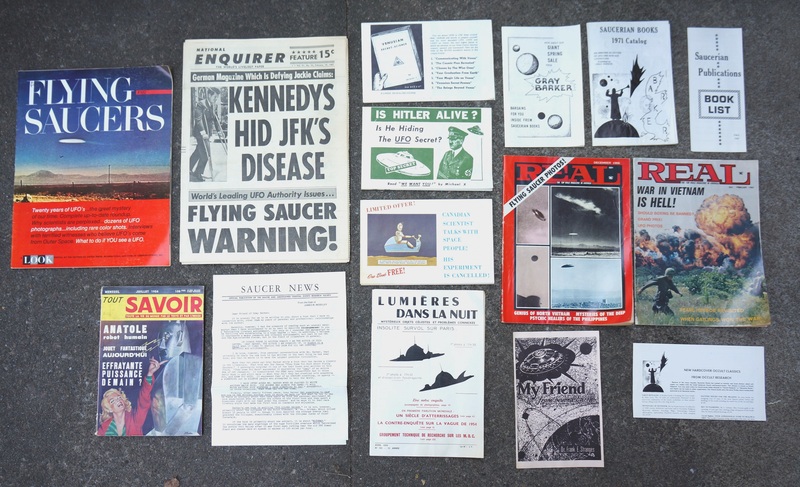 There’s a very healthy market for old UFO stuff. I found this collection in Rosemont back in July. Speaking of fringe beliefs, 2016 saw the first time I ever came across anything that was overtly and unapologetically racist. This stuff came from the same house as the UFO lit; that guy was into definitely into some next ideas. 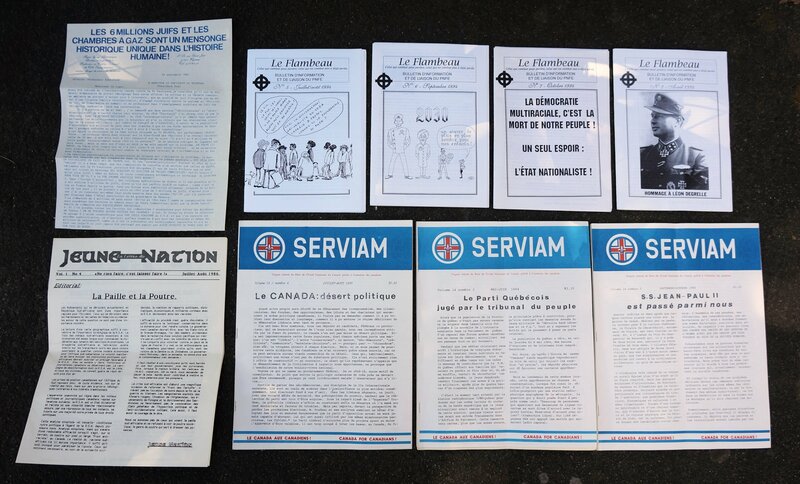 Most of the literature dated from between the early 80s and late 90s and was distributed by different organizations in Quebec, France, and Belgium. 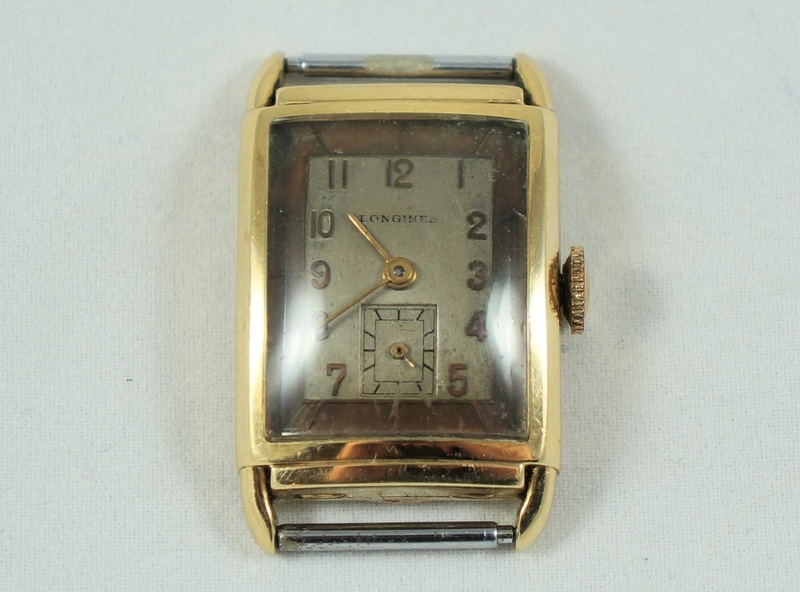 I listed it on eBay hoping to find a buyer who was interested in researching the different movements but I haven’t had any luck thus far. I found a lot more besides this first haul, but I figured I’d shared enough already. 2016 was a great year for finding Apple products. I made hundreds of dollars selling several iPods, three iPads, and a mostly functional MacBook Pro. I hope the trend continues in 2017! One of my favourite spots of the year was actually in Ahunstic, where I happened upon an intriguing pile (post one, post two, post three) on my way home from Ville St Laurent. I went back to the same spot for several weeks and collected many, mostly small items, including a bit of gold and one of my favourite finds of the year. However, sorting through the stuff on the curb was challenging at times because for every cool thing there were ten that were ruined or just plain junk. Let’s just say I’m glad I got my tetanus booster not long before stopping there. 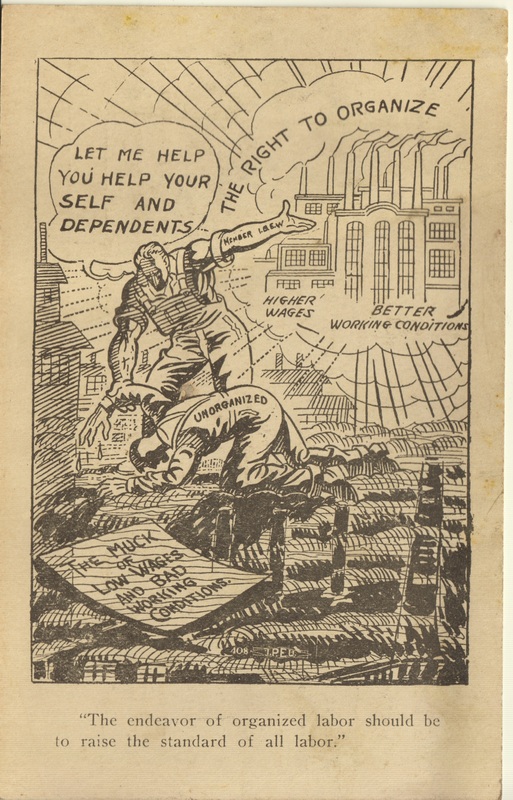 I thought of the spot as “The Muck,” in reference to the c.1920s union application card that I found there that first time. The part of Ahuntsic that produced this stuff was distinctly lower middle class, so this is a good reminder that cool trash can come from just about anywhere. I saved about 2-300 postcards from a recycling bin way back in May. 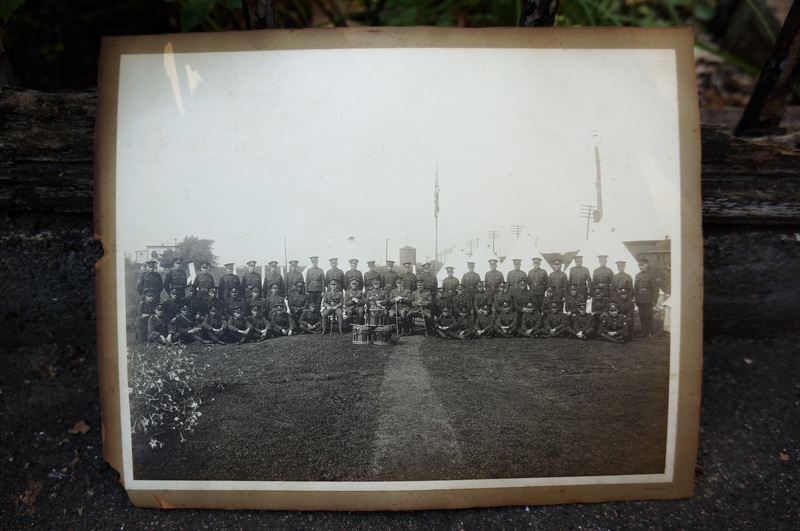 Most dated from between the 1930s and 1950s. 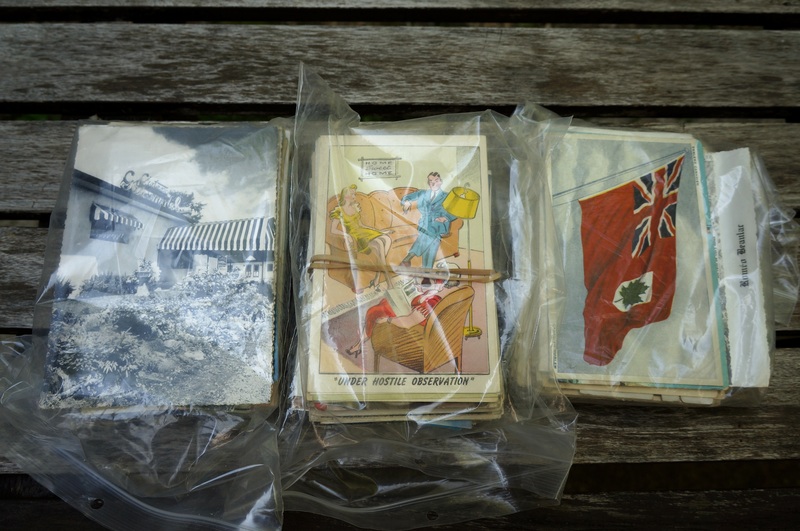 None were particularly valuable on their own (I think the most valuable were a pair of old Chinese postcards that went for 40$) but altogether they made me a couple hundred bucks. 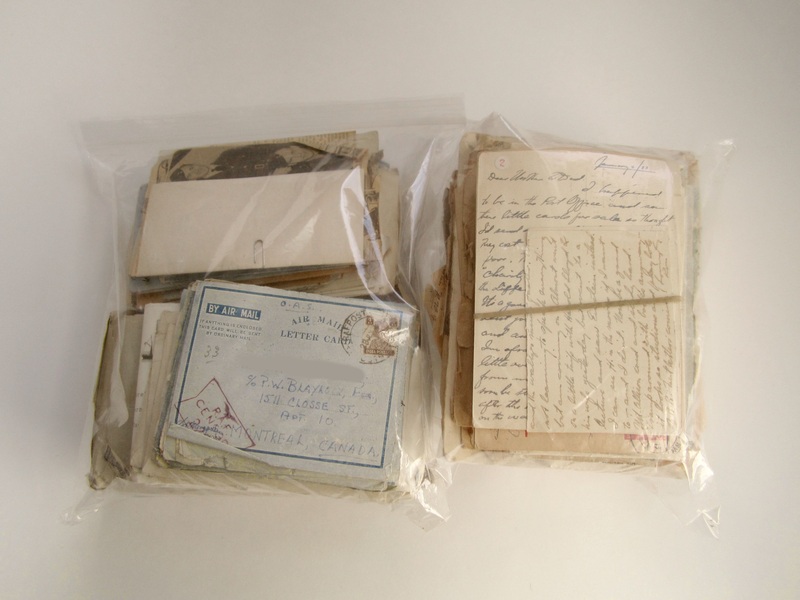 I learned a lot about the postcard market by selling them, and maybe that knowledge will come in handy in the future. 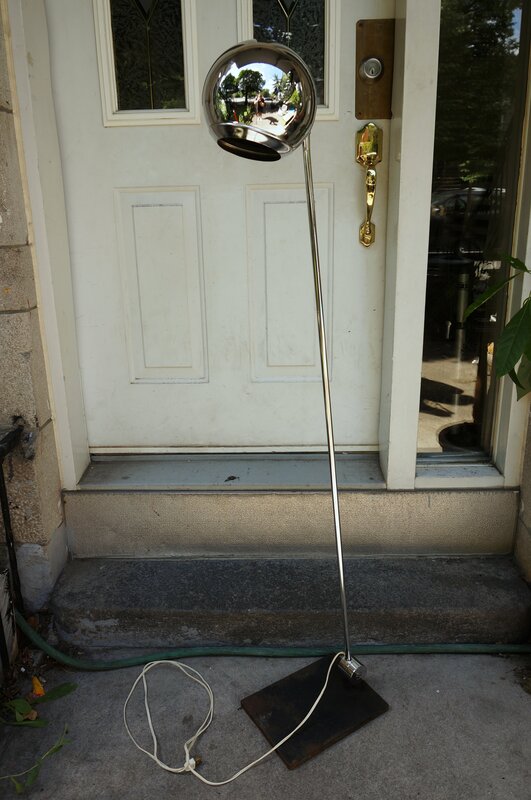 This mid-century lamp was a nice get. It was designed by a guy named Robert Sonneman and similar lamps are listed on 1stDibs for 1000$ each or more. I doubt I’ll get that much but I’m sure this lamp will make me a bit of money eventually. It’s in pretty good condition overall, but I have yet to clean up the cast-iron base which is a bit rusty. I figure it’ll sell for more if I can get that cast iron looking black again. This photo, which is likely over 100 years old, was hidden behind a picture of Brother Andre that looked to have been clipped from a magazine. It’s a neat piece of history, and it ended up selling to a local collector for 83$. That was more than I expected! I found these way back in January. I remember the homeowner coming out and telling me not to pick there, but I already had some cool stuff in the car including these bags of letters. Here’s hoping I didn’t miss out on anything good. I haven’t actually spent much time looking at the letters, but my mom read some of them and said that there were two authors, one of which was actually a pretty good writer. It might be interesting to do something with them at some point. 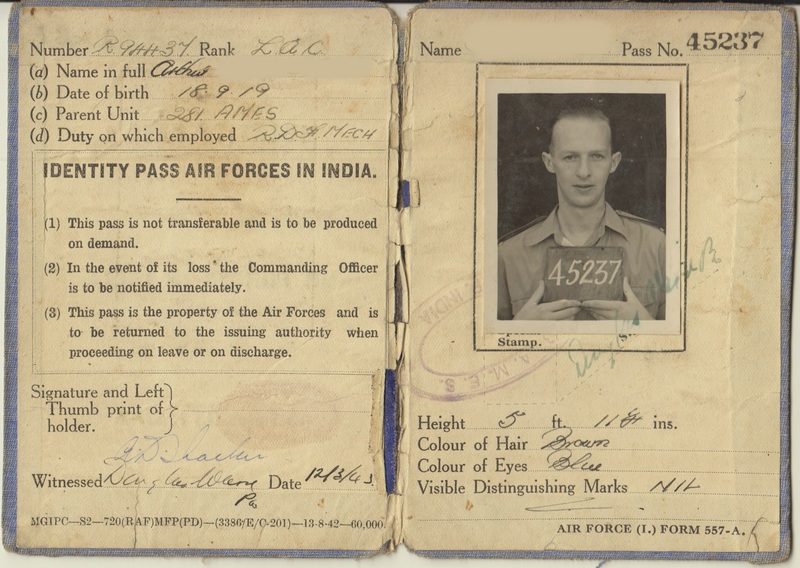 My favourite pieces were the Military ID cards, especially the one below. I haven’t been able to find a card quite like it online. 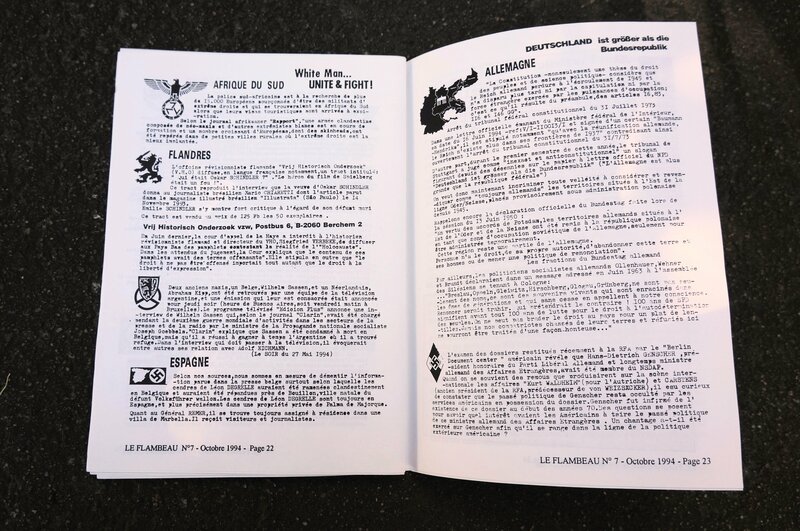 These magazines filled two document boxes. Most were Vogues or Harper’s Bazaars that dated from between the 50s and 70s. 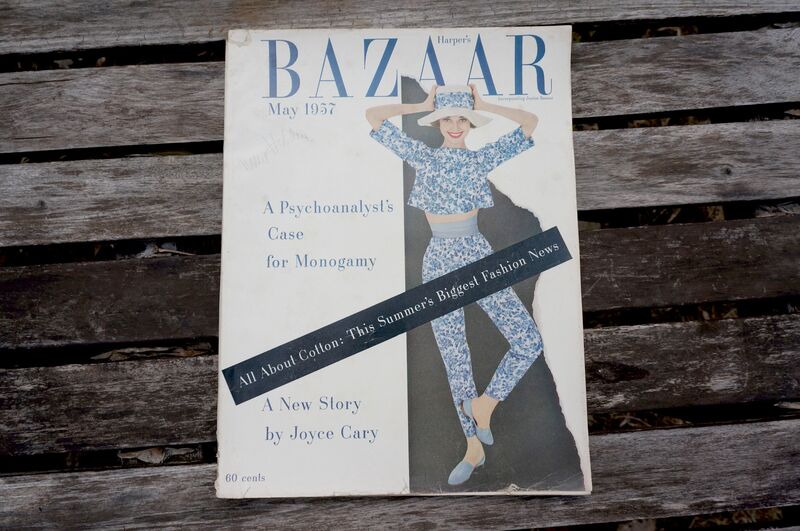 Some were individually valuable, such as the issues of Harper’s Bazaar featuring drawings by Andy Warhol or the ones with Audrey Hepburn on the cover, but most were in poor enough condition that they were best sold for collage. Fortunately, I have a friend here who does just that. 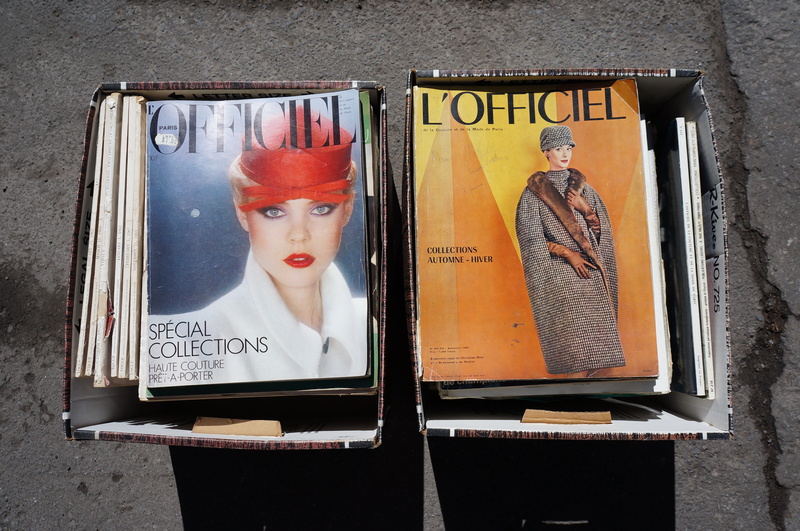 Apparently fashion magazines from this era are the best to collage with because of their high print quality. I’ve made a few hundred dollars off them already, and I still have some left to sell. 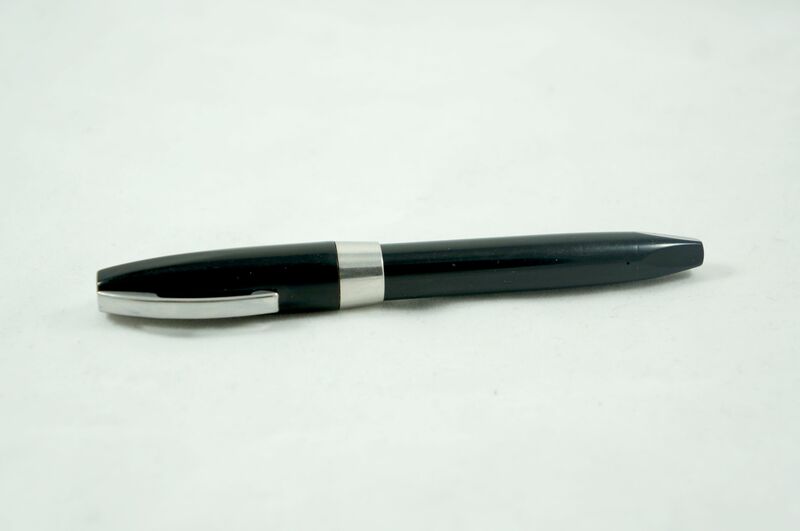 The most valuable of the bunch was a vintage Sheaffer PFM (“Pen for Men” – above) that sold for 175$, but there was also a nice Sheaffer Imperial and a desk pen with a 14k gold nib, not to mention several other yard saleable pens and vintage pencils. All in all the collection should net me a few hundred dollars. It seems like I find a couple gold watches a year. I hope that keeps up because they’re easy money! Longines is a good brand, and was pretty well regarded back in the day according to posters on watch collector message boards. It hasn’t sold yet, but I recently uploaded a better picture (thanks light box!) so maybe it’ll head on its way soon enough. 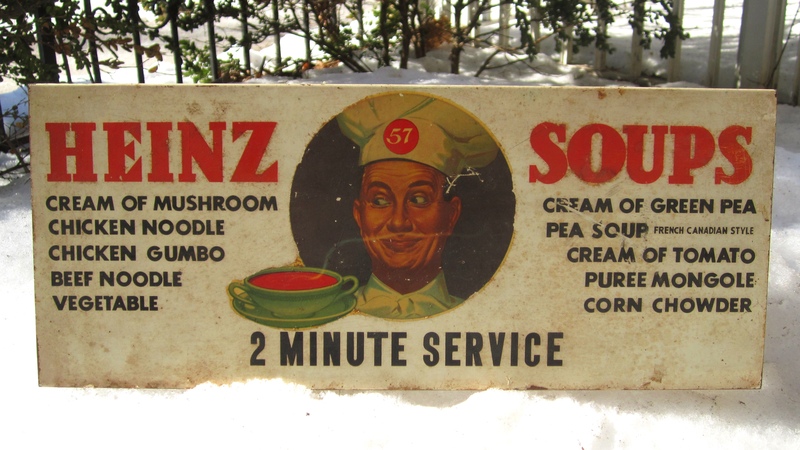 This sign came off a vintage “electric soup kitchen” that was designed to heat a can of soup in 2 minutes. 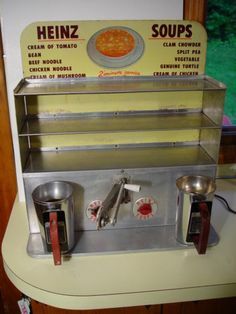 These machines were made in the 30s and 40s but there’s not too many kicking around anymore. It’s a neat piece of history, one that ended up netting me 270$ on eBay. I saved a whole bunch of neat pennants, most of which featured various Canadian towns, but these WWI era military pennants were the coolest and most valuable. 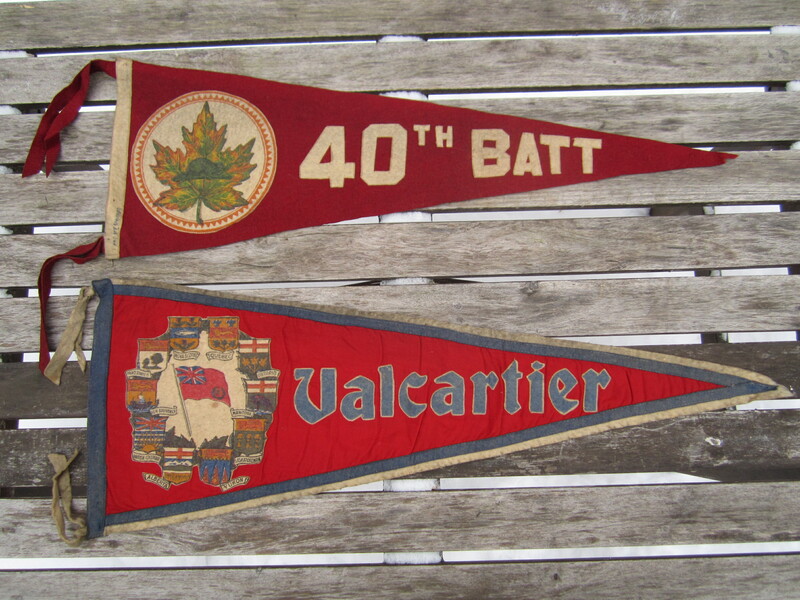 The Valcartier pennant ended up selling for 160$, while the 40th Battallion pennant sold for 110$. Most of the others went to the yard sale bin, but one from Lowell High School (Jack Kerouac’s alma mater) went for another 30$ on eBay. My first and finest gold watch of the year. 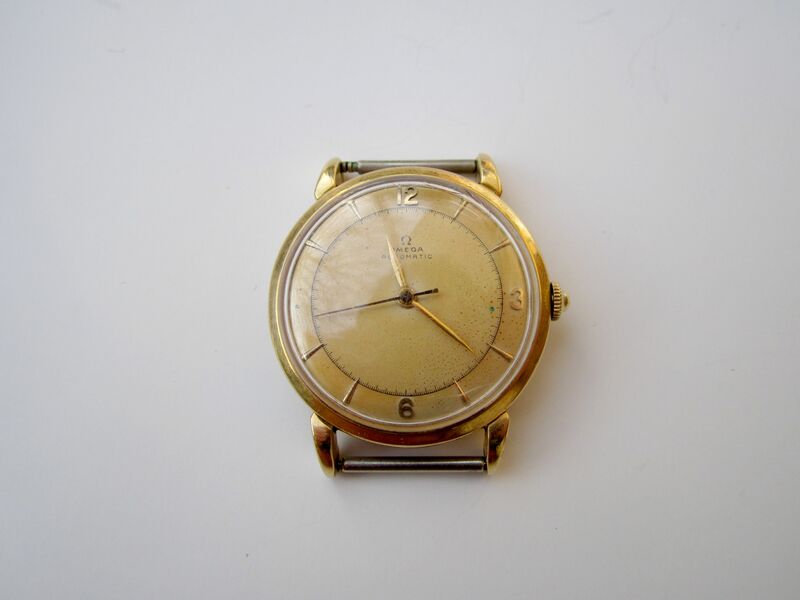 Omega is a luxury brand, so while the watch wasn’t in perfect condition it was a worthwhile project to a handy watch collector. 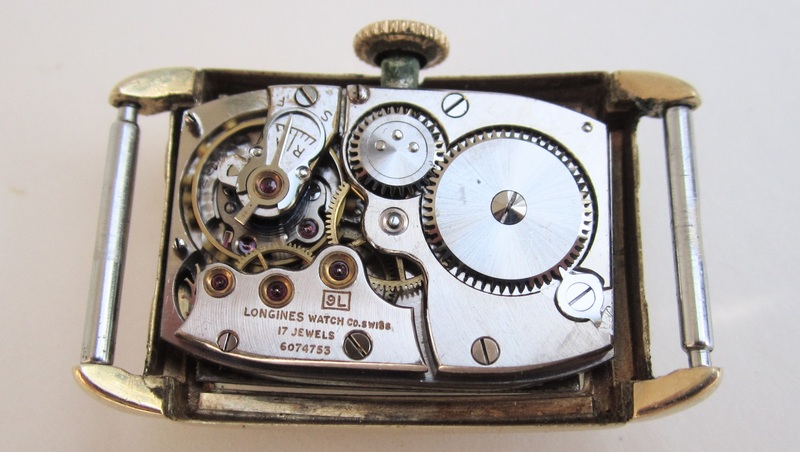 The movement itself worked well, and it ended up going for almost 500$ on eBay. This was easily my best find from McGill’s moveout day. It’s hard to believe that someone would throw it out as it’s easily worth several hundred dollars. It works fine – in fact, I’m using it right now. Here’s hoping I have similar luck in the ghetto again next year, though I’m not holding my breath. Lots of great stuff gets tossed on moveout day but not many people throw out awesome laptops. That requires a special, and hopefully uncommon brand of privilege. It might not look like much, but apparently this chair is pretty exciting if you’re really into mid-century modern furniture. It was designed by George Nakashima as part of his “Origins” line. 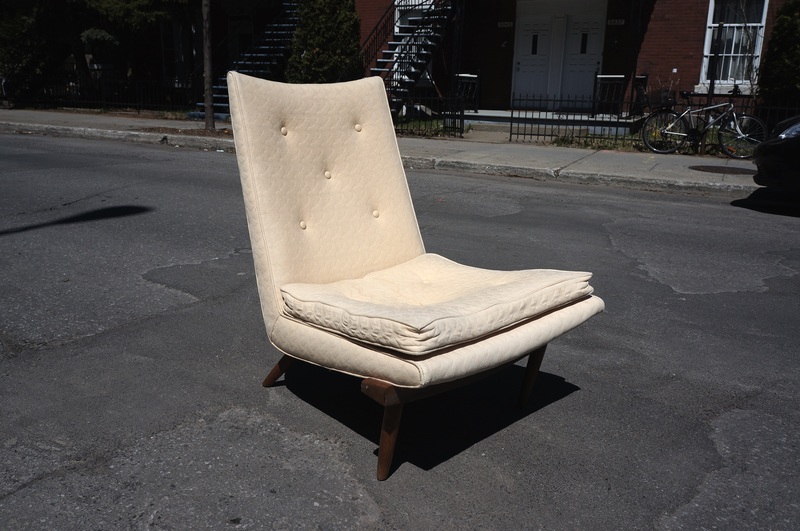 It needed reupholstering, but it still sold quickly for around 950$ Canadian dollars. This was definitely the most perfume I ever found in one spot. These weren’t cheap perfumes either – most were made by well respected brands such as Guerlain, Christian Dior, Yves St Laurent, and Balenciaga. 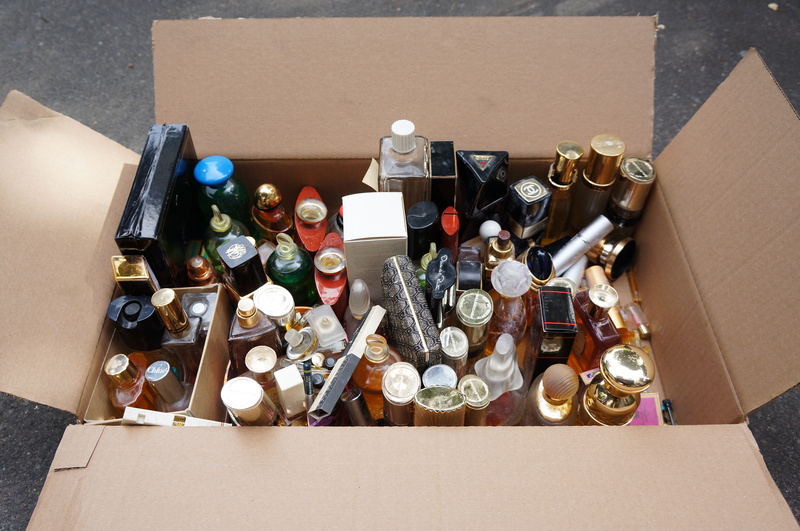 I had to work for them though, as the perfumes in this box were spread across several black trash bags and were mixed in with cosmetics that don’t age nearly as well. I’ve already made several hundred dollars from this collection, and I’ll probably earn well over a thousand when all is said and done. It took me a while to decide, but I think this election badge was my favourite find of the year. It’s certainly an interesting piece. Henri Bourassa is an important figure in the history of Quebec, being one of the first to promote a brand of French-Canadian nationalism (though not separatism, which would emerge later). He founded the newspaper Le Devoir, which still exists today, and there’s a pretty major road named after him in the north of Montreal. He somehow managed to personally win two different ridings in that 1908 provincial election. I don’t think that’s even possible any more. 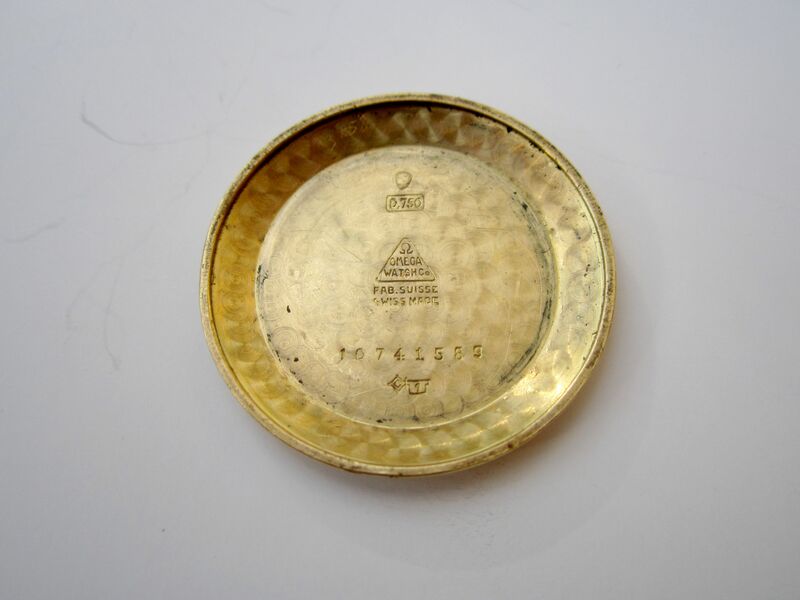 The pin also appear to be pretty rare – I couldn’t find anything like it on Google. 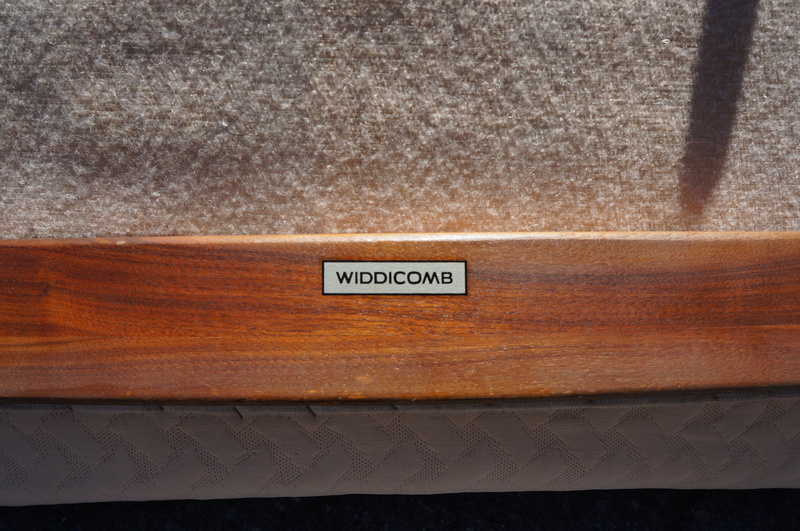 Maybe there’s a few others kicking around out there somewhere, but it’s very cool to save something so uncommon. The fact that this photo comes up when you do research on Henri Bourassa makes me think that I’ve contributed, if only slightly to humanity’s wealth of knowledge. As the coolest thing I found from “The Muck” it reminds me that, while rich people’s garbage is pretty good, common folk can have pretty cool stuff too. This kind of thing acts as inspiration to keep me doing my bike trash runs in the Plateau and Mile End. Even though I often won’t find much of anything, sometimes I do get pretty lucky. Of course, I also like that it made me some money. It eventually sold for 350$, which is a lot for a button! Let’s hope my finds in 2017 can at least hold a candle to these! RE: your rusty lamp base … the Chinese use salt and cooking oil to clean up heavily rusted woks. It’s also non toxic. Generous amount of salt and enough oil to make a gritty paste. If it works for woks, it should work for your lamp base. Wow! Great stuff all around, I’m glad your made money from these. I love what you do. i wish I could do it. what I want to know is when you find this stuff do you research every single thing .how do you know so much about so many different things. I don’t really know that much, ha ha. I do basic research (ie: what something sells for) on a lot of items and more research (ie: the history) on more interesting things. I’ve actually learned a lot through trash picking and looking up my finds. Keep on keeping on! Enjoy seeing all your findings. I’m glad things are working out for you. Love that green lamp — Gorgeous! 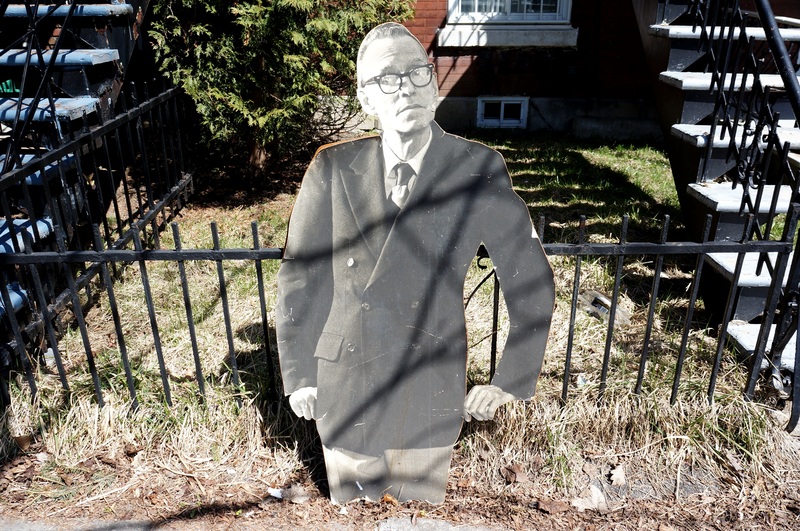 The cardboard cut-out man looks so familiar to me, having watched plenty of old-time TV. I want to say it might be Jack Benny. I found him on Wikipedia. It kind of looks like him, but not really. Wiki has pictures of him being older, and the other photos are too small to tell. Hopefully, someone can come up with a name and a photo for you. I love seeing what you find, so I’m glad that may still appear from time to time. Let us know what you decide for the future. You are a superb writer,historian and photographer.You are not even 30.I am amazed.You know more about many historical things than several 60 year-olds.Bravo. If you have the time try it out! There really not much to lose unless there’s specific laws against it in your area. Also, it’s good to watch out for bedbugs and other critters. I think you’re correct Marie. He was publisher and writer Random House. He wrote a book, “At Random” and picture on cover bears strong resemblance. Maybe this was promotion for book. Plus he was a great humorist. Maybe, I feel like this is one of the better guesses. My guy looks pretty stern though, I’m not sure Bennett could pull that off. Love seeing and hearing about your finds. I’m from Caribou, Maine, which is on the Canadian border, and most of my maternal ancestors immigrated from Canada. So, love seeing and hearing about the history of Canada you dig up.. You should really do some ebooks about your finds and the history. You could even turn your blog posts into ebooks. Keep the finds coming. Hear, hear Judy!! I’d buy the book(s)!! This site – his finds, writing, photography, and ethics – are wonderful. No post fails to inspire or uplift or make me go “huh!”. SOOOOO glad for Martin’s work in my world. Glad to hear it! I do think I’ll try to write a book of some kind this year, so it’s go to know at least a couple people would buy it. 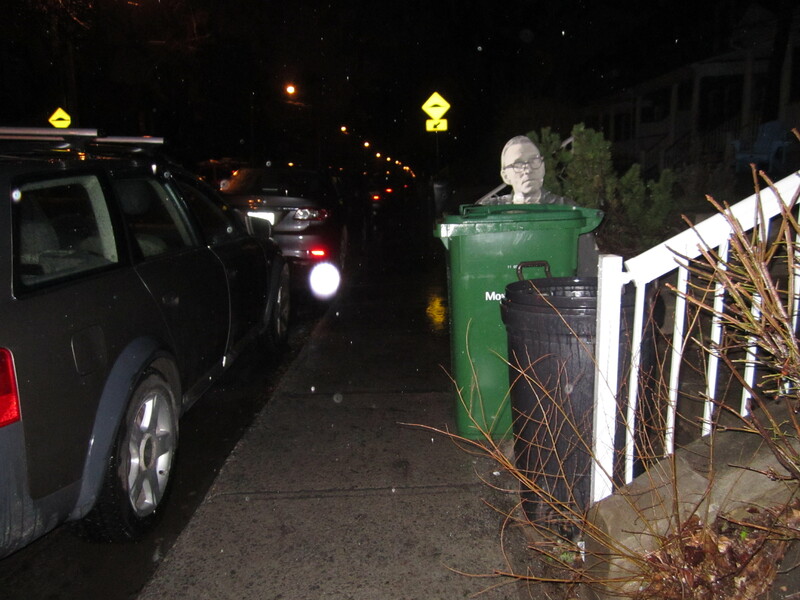 The weather is very mild right now.Please take advantage of this and find new treasures in the trash for the next two or three days.Cheers. I found an 80gig iPod a few summers ago, on or around July 1st. It was actually on a street above Jeanne Mance Park, the block above Mount Royal. There was even a soldering iron in the same box. I figured bad battery, but once I charged it from something better than a usb port on my computer, it took a charge. It did work. I don’t expect to find another one in that block. Those 80gb ones (I think they’re called “Classic”) are worth decent money. If I remember right I sold one I found for 100$ a little while back. I think you’re bound to find iPods anywhere there are lots of young people with disposable income. I found most in the Plateau / Mile End / McGill area and in bags. Sometimes it’s just about being in the right place at the right time. It can be a profitable hobby / side job, or even a full-time think potentially though the profit upside isn’t necessarily that great. You could make a habit of going out on one or two trash days a week and seeing what you find. Focus more on rich areas and those with a lot of history. Hi,I admire your blog and the awareness of waste that you are spreading.I live in a suburb of Boston.,Mass and I have rescued paintings and dolls from the neighborhood trash.I was a victim of credit card cloning three years ago and I suffered some financial loss.I recouped 80% of the money lost through action ,but 400$ net loss of the $2000 stolen still hurt me deeply.I live in a safe neighborhood and pay for cash at groceries,hardware stores,restaurants,etc.I make my monthly mortgage payments with e-transfer,but all small items with cash only.I feel safer this way and only carry small amounts of cash. Please oppose the cashless society that governments want to spread.I strongly oppose cashless societies.I value my privacy as well.Say no to the cashless society. Thanks. I don’t personally care for the cashless idea yet, as I don’t really see the point. Maybe someday it’ll make sense, who knows, but it doesn’t right now. As many readers realize, there has been a global movement pushing the nations gradually into a cashless society. That movement just hit a roadblock, and its name is Germany. As the first link reports, the German population is very disinclined (to say the least) about adopting a cashless society. As we have just witnessed in the Greek debt crisis negotiations, Germany is essentially in charge of Europe’s financial future at present so the opposition of Germans to a cashless society matters a great deal. The first link reports that “In Germany, abandoning cash is nothing short of heresy,” and adds a remarkable detail that a German Central Bank study revealed that two-thirds of Germans don’t even own a credit card (such is their aversion to debt and digital money of any kind). It also adds that the revelations about mass NSA spying on electronic affairs of all kinds has “fueled distrust” of financial electronic records. Those revelations have likely affected the views of many people in many nations, not just in Germany. I was also surprised to learn in this link that almost half of all Americans don’t own any credit cards, so Americans would also be averse to any cashless society. In contrast, Sweden and the United Kingdom are nations where credit card usage is high. For balance, I included the second link which argues that Germany is headed for a cashless society. However, that source includes an advertisement for bitcoin in is text so it isn’t purely a “news” story. The first link carries much more weight, in my view. The third link does report that Denmark is favorable to a cashless society. However, it is Germany that is now “calling the shots” in Europe regarding the EU’s financial matters, and Germans adamantly don’t want a cashless society. The spectacle of Greeks lining up for weeks to withdraw meager amounts of currency from ATMs has also likely lessened the trust of millions of Europeans in a cashless society. It demonstrated graphically that if there is no in-hand currency, one could end up with no access one’s money in the banking system in any cashless society. What happened in Greece could happen just about anywhere else too. Many Christian observers have expected a cashless society to develop, based on the prophecy of Revelation 13:16-17; however, it is possible that too much has been read into that prophecy. I think the deep German preference for currency over digital money is that Germany has a deep-seated mistrust of runaway inflation due to the wild monetary inflation that occurred in the Wiemar Republic—which led to Hitler’s dictatorship and the ruin of Germany. With a purely digital money system, there could be runaway monetary inflation by governmental and banking leaders with little evidence “on the street”‘ that it was occurring. This is already happening in the USA, where the monetary base has been wildly inflated by the US Federal Reserve Board via “quantitative easing” a euphemism for a wild increase in the money supply. However, since this wild increase in the supply of US dollars is in digital form, it has largely gone unnoticed by the masses. Given the advances in RFID technology and other forms of tracking mechanisms, it is entirely possible that the world will never go to a cashless society where there is no actual currency. One can envision a world where there is plenty of currency, but where it is embedded with RFID tracking chips that would signal authorities about currency transactions or accumulations above a certain threshold. Perhaps that is how Revelation 13:16-17 will be fulfilled. The powers-that-be aren’t concerned with people using currency to buy groceries, gas for their cars and other routine expenses. None of these currency usages represent any threat to the power of the elites. Indeed, the global corporations want to encourage people to spend money regularly. It may be that Revelation 13:16-17’s prophecy will be fulfilled by regulations from a future “beast” power that will want to monitor cash flows and purchases over certain levels. Its is still possible a cashless (currency-free) society will be imposed under the beast system when there is sufficient chaos after the fall of the current Babylon the Great system (as prophesied in Revelation 17-18) to dramatically alter current realities, but for now a global cashless society is not likely to occur as long as Germany–the financial powerhouse of Europe–is strongly opposed to it. You must stand against the idea of a cashless society.Otherwise people like you,bottle and can collectors,etc would lose most of their freedoms. Australia is pushing a cashless society too.The more people promote a cashless society,the more I use cash.If you want to keep your economic freedom,remember my words. I work in a coffee shop part-time and go to university at the same time.My job does not pay too much and I am trying to keep student debt down.I am quite opposed to a cashless society because it entails loss of options.About 60% of the clients here pay by credit card or debit card,but many customers still pay cash.Some of my customers who are very friendly leave me tips in coins like toonies and loonies(even though they are not obliged to leave tips).They know my situation and want to help out a pleasant student.I am a frugal student,and this gives me a bit more discretionary income.In a cashless society you would have no privacy left at all. A cashless society is very dangerous idea.Read this letter from THE IRISH TIMES.Please increase your use of cash,not decrease it. Sir, – Conor Pope bemoans how Ireland lags behind Sweden in moving away from cash in favour of electronic payments without considering whether this is truly the path we should be taking (“Money walks: Ireland readies to go cashless, eventually”, November 14th). Cash has a major advantage over debit cards in that it is completely anonymous and untraceable. Any electronic payment leaves a log on the servers belonging to the companies who manage the transaction, which is a major problem for those of us who care about privacy. Furthermore, these same companies have absolute power to decide where we can and cannot spend what is supposedly our own money. Visa and MasterCard have already removed people’s choices in how to spend their own money in December 2010, when they blocked all donations to WikiLeaks. If cash is completely abolished, our spending will be at the mercy of a handful of financial companies. If they are willing to completely block payments to any one entity, what is to stop them from blocking all payments to companies or individuals who they have not pre-approved, which you just know would require substantial fees that small businesses can barely afford? Major credit card firms could easily decide to partner with major retailers to offer special reduced transaction fees, thus granting those companies a significant pricing advantage and moving ever closer to monopoly.